years. In September 2014, Bavaria took over the Rochefort (France) based company and since then they have advanced production, supported the development of new models as well as the expansion of the dealer and service network. Bavaria Catamarans’ new Nautitech 46 Fly will have its world premier at the Salon Nautique in Cannes at the beginning of September. Along with the successful Nautitech 40 Open, the order numbers for the Nautitech 46 Open and Fly are at maximum capacity. The interior of the Nautitech 40 and Nautitech 46 are already being manufactured in Bavaria’s main factory in Giebelstadt near Würzburg (Germany). Further expansion of production at Rochefort is planned for the coming year. Kiton, a leading Italian company in the sector of bespoke tailoring and haute couture, is continuing to focus on end consumers and has signed a strategic partnership with Benetti, one of the world’s oldest yacht builders. The synergy between the two companies stems from the common goal of creating an exclusive bespoke experience for end consumers in line with a shared philosophy and shared values: passion, innovation and craftsmanship. “The aim of the partnership is to devote increasing attention to our customers who have chosen a unique and exclusive lifestyle”, says Antonio De Matteis, CEO of Kiton. He adds “Excellence and quality: these are the basic principles of our partnership of which I’m extremely proud. Benetti is a beacon of Italian excellence which perfectly matches our own values: a family-oriented atmosphere, innovation, style and quality.” “The distinctive style of two ambassadors of Italian manufacturing excellence is ideally suited to this agreement which will accompany us in boat shows throughout the world and other spheres as well”, commented Fabio Ermetto, chief content officer of Benetti. For the international boat shows scheduled until 2017 (the Cannes, Montecarlo, Fort Lauderdale, Miami, Dubai, Singapore and Hong Kong boat shows), Kiton’s professional tailors will be available to lend their skills to the leading yacht builder Benetti while the top clients of the Neapolitan fashion house will have privileged access to the world of Italian super yachts. The partnership will offer Benetti’s top clients the opportunity to arrange private visits to Kiton’s premises in Naples and Milan while Kiton’s top clients will be able to visit the “Yachtique” styling lounges devoted to luxury yachting as well as the Benetti boutique in Viareggio. Lobster and lighthouses, historic homes and craggy coastlines; that's what we envision when we think of New England in the summertime. With its spectacular cruising waters, this is one of the world's top destinations for yachtsmen and women from around the globe. This summer, the new Hatteras 70 Motor Yacht is gracing New England's coastal waters as well, on its "demo tour" with the team from Boston Yacht Sales. The Board of Directors of The Hinckley Company, is thrilled to announce that Peter O'Connell will be joining the team as the Company's President and Chief Executive Officer in Portsmouth, RI on September 1st. Peter and his family currently live in Madison, CT and will soon be relocating to Rhode Island. Peter is an experienced and avid boater and also the proud owner of a Hinckley Picnic Boat called Retriever. After a thorough and exhaustive search process, Peter rose easily to become our top candidate. He embodies exactly what we sought for this important role. His experience as a Hinckley buyer and service customer provide useful insights and perspectives. He has proven successes as CEO of important and relevant companies, including Navtec and Lewmar. Most recently he served as CEO of Datacom Systems, a privately held technology company. But above all these career distinctions, Peter's winning and infectious personality made him the leading candidate to become the seventh CEO in our Company's rich history. Thierry Verstraete has resumed his attempt to solo navigate his Nordhavn 56 Motorsailer from Newport, RI to Belgium. After a 12-day layover in the Azores, Verstraete has resolved his autopilot issues, caught up on sleep and is taking on Leg 2 of his mission with renewed gusto. During the first 20 days at sea, Deo Juvante has performed flawlessly until a sudden glitch with its auto-pilot forced Verstraete to pull into the Azores for an unexpected layover. Late last week, a technician from Cay Electronics in Portsmouth, RI, which performed the initial install flew over to fix the autopilot. The tech added a second autopilot; with the redundancy Verstraete hopes to avoid the problem again. After spending the past two weeks getting some badly needed shut-eye, Verstraete resumed his quest to conquer the Atlantic alone. The failed autopilot was an abrupt and brutal hiccup in Verstraete’s trip and not one that could be overcome due to its vital role in solo cruising. Despite dashing his dream of a non-stop passage, Verstraete has certainly made the most of his time in the Azores by exploring the island, putting his painted stamp on the a concrete walkway surrounding Marina Horta, and re-uniting with his family who flew from Belgium to see him. Verstraete has approximately 1400 nm remaining in the second leg of his trip. In doing so, even broken into two legs, he will become the first person ever to solo-cross an ocean in a Nordhavn. Inside Princess is a new engaging suite of short films that lifts the lid on the craftsmanship, skill and passion that goes into each and every yacht produced. Launched 31st July exclusively to the Princess fan-base via social media over a 6 week period, viewers can take a closer look at some of the incredible crafts that go into producing some of the most exquisite yachts in the world, from carpentry to metal work, loom production to infusion moulding. Princess Yachts invite viewers to immerse themselves in a world of unparalleled craftsmanship and meet the people that give brilliance to each and every component. Riviera Australia’s largest and most awarded luxury motor yacht builder – has formally recognised its dedicated R Marine network of dealers for their outstanding commitment to excellence in sales and service. R Marine exclusively representing the Riviera and Belize brands throughout Australia and New Zealand is the Asia Pacific’s most experienced luxury motor yacht dealer network and strives relentlessly to assist Riviera’s growing family of owners to enjoy ‘the ultimate boating experience’. In announcing the winners of the 2016 Riviera Australian and New Zealand Dealer Awards, chairman and owner Rodney Longhurst said Riviera is totally focused on the pursuit of excellence. “Our commitment extends far beyond building luxurious motor yachts that are acknowledged as being amongst the best in the world – it filters all the way through to providing the outstanding owner care that makes owning a Riviera such a rewarding and pleasurable experience. “The loyalty of our highly valued owners in Australia and New Zealand confirms there’s nothing quite like owning a Riviera and this directly reflects the huge commitment of our R Marine dealer network of marine professionals. There are myriad reasons that Australia’s wonderful Whitsundays region holds such a special place in the hearts of so many people right around the world. Beautiful white sandy beaches, stunning mountain scenery, lush sub-tropical rainforests, island escapes, world-class accommodation and many-hatted restaurants can be enjoyed year-round by almost everyone who visits. For members of the Riviera Family of owners, the appeal extends even further. For instance, there’s the freedom to enjoy the beautiful turquoise waters, calm cruising conditions and secluded anchorages of the iconic Great Barrier Reef in the premium luxury of your own world-class motor yacht. You can explore the myriad, kaleidoscopic diving destinations and bountiful, teeming fishing grounds almost at will. Of course, the exhilaration and fun of cruising there in company of fellow Riviera Family members is a major part of the overall experience. Over two fun-filled weeks, the R Marine Crawley Whitsundays Experience saw 10 yachts travelling in convoy for the 630-natuical mile journey taking in such iconic places as Wide Bay Bar, Kingfisher Resort, Lady Musgrave Island, Lady Percy Island and Hamilton Island, name but a few. R Marine Crawley dealer principal Ben Crawley said this year’s Whitsundays Experience saw some participants undertaking the extended passage for the first time. John McDonald, who with wife Jill has owned a 51 Riviera Enclosed Flybridge for about five years, said the Whitsundays Experience was the farthest north he had cruised. Greg Rekers, who owns his Riviera 47 Open Flybridge Rastus with wife Vicki, said being able to enjoy blue-water cruising and inspiring experiences was definitely a highlight. Andy Smith, who has owned his third Riviera, the 51 Enclosed Flybridge Reel Dynamic, for four months, said he and wife Kristen enjoyed their first Experience journey immensely. Which brings us to the tender fishing competition. Ben Crawley thanked all those who took part in the 2016 Whitsundays Experience, adding that $7500 had been raised to support SANDS, a charity that works with families that have experienced the loss of little one. With many Riviera owners staying north for the winter, R Marine Crawley has some more Experience events planned. Sunseeker International is delighted to announce that it will be launching a brand new exclusive range of merchandise, named the ‘Sunseeker Collection’ at the Southampton Boat Show. Featuring a stunning selection of clothing, leather goods and accessories, the new Sunseeker Collection will be unveiled on the Sunseeker stand during the Southampton Boat Show, from 16th to 25th September. This unique 15-line collection from Sunseeker includes a selection of high performance Henri Lloyd jackets, caps and polo shirts, alongside beautifully crafted Italian leather wallets, briefcases, document bags and weekender holdalls and other accessories all featuring the iconic Sunseeker branding. Synonymous with luxury, performance and style, the new Sunseeker Collection is a valuable addition to the Sunseeker brand. Viking 62s were on fire at the Beach Haven White Marlin Invitational. The Viking 62 Business sat at the top of the leaderboard for Blue Marlin Releases. Tra Sea Ann, another 62, claimed Second Place in the White Marlin Release category and Second Place Overall Releases. The Viking 62 was Second Place Blue Marlin Releases on time, Third Place White Marlin and took the heaviest mahi at 46 pounds, just one pound shy of the Beach Haven Marlin and Tuna Club record. Bucking the 62 trend was the Viking 58 Alyson Roseclaiming the third heaviest tuna. Two years ago Frank Mazza took delivery of his new Viking 55 Tami Ann and headed out to the Tri-State Canyon Shootout. The boat went out with guns blazing and claimed Top Tuna with a 278.5 pound bigeye. Fast forward to summer 2016. Frank recently left the Viking factory with his new Viking 62 Tami Ann and headed back to the Canyon Shootout. "Sea conditions were horrible," said Frank, "but we were comfortable with our Seakeeper working better than we expected." When the dust settled, Frank thumped a big yellowfin on the dock weighing in at 72.5 pounds to take the top spot on the yellowfin leaderboard as well as Third Place Overall. Do we sense a trend here? Congratulations are also in order for Nick Mastroianni and his crew on the Viking 80 China Time. Angler Nick Mastroianni, III, boated a 27.5 pound mahi mahi to take second place in that category. Josh Sharp, fishing on Rick Levinson's Viking 60 SeaFlame was the spoiler on the last day of the White Marlin Open. Josh hauled a 39 pound dolphin to the scales knocking out the competition and putting him in the top spot on the leaderboard. In addition to Top Dolphin, SeaFlame also released a white marlin, blue marlin and spearfish. Other notable placings amongst a field of 329 boats were Dave Anderson's Viking 70 Krazy Salt's in 2nd place for Top Boat and Top Release Boat with 25 white marlin releases while the Viking 52 Miss Annietook 5th place Top Boat and Release Boat and angler Mark Donahue claimed 7th Place Angler with nine releases. Intents, a Viking 62 took 6th Top Boat and Top Release Boat, Viking 62 Tra Sea Ann was 10th place Top Release Boat and angler Rob Manetta picked up 4th Place Angler with 10 white releases. The Viking 70 Makara claimed 9th place Top Boat and Carmine Caruso on his Viking 70 Pipe Dreamer was 5th Place Angler with nine whites. Captain Brian Komer led his Viking 62 team to Top Release Boat at the Ocean City Marlin and Tuna Club's Overnight Billfish Tournament. During the overnighter the crew released eight white marlin to not only claim the top release title but also Second Place Boat overall. Rounding out the Release Division in Second Place was the Viking 46 Captain Chazz with five whites and a blue while Third Place was awarded to the Viking 50 Anthracite with four whites and a blue plus a 37.5 pound dolphin put them on the top of that category. Captain Chazz also picked up Third Place Overall and Kirky Dolaway was Top Junior Angler. Polarizer, a Viking 55, boated a 105 pound sword for Third Place Swordfish. After being postponed a week due to bad weather, the bite couldn't have been hotter. With so many grand slams and double headers, the radio had a hard time keeping track of the leaders. When the smoke cleared, the Viking 61 Got'M On was the tournament champion releasing two blue marlin and six sailfish, all by lady angler Emily Scott. The Viking 68 High Cotton weighed in a 112 pounder to win Largest Tuna. The Viking 52 Sport Tower Snafu, owned by Jacque Kuchta and David Branton fished the New Orleans Big Game Fishing Club's Ladies Invitational in high fashion. Pretty in pink, Julie Kuchta brought a 137.1 pound tuna to the scale to take Third Place in that division. New name old roots! Solaria is a new builder from Naples Italy, founded by Giuseppe Cimino who will go to the 2016 Cannes boat show with two new models a 40 and 54. Cimino is known for founding Conam; Costruzioni Navali Mediterraneo in the 1980s, a company he sold in around 2006 to Rodriguez Group which then was liquidated in 2010. The above 54 is Solaria second model, with a 40 currently under going sea trials. 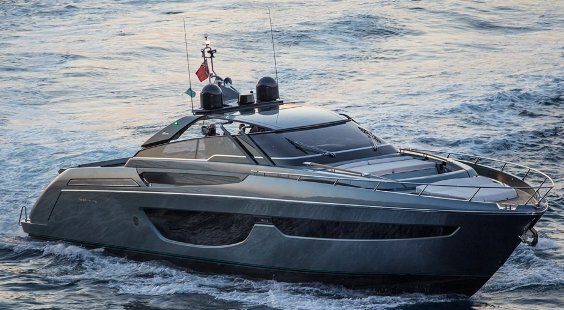 Both models still show Cimino innovative spirit, and this new 54 aims to merge walk around day boat features with that of a full yacht. The Solaria 54 will feature a three double cabin interior, plus a crew cabin. 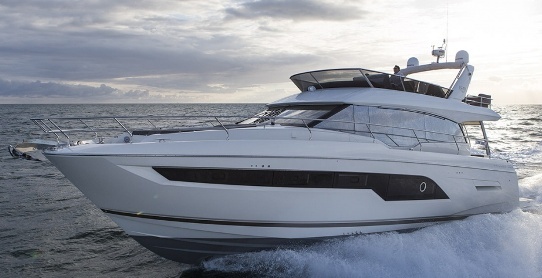 Speeds are estimated at a max of 35 knots with twin Volvo 900hp engines and IPS pod drives propulsion. Princess launch the new 75 MY at the beginning of 2016, a very interesting four cabin motor yacht set to continue the growing success the 72 has received in recent years. Designed as all Princess since three decades by Bernard Olesinski the 75 MY impresses for its huge spaces, the single level saloon main deck, and very spacious flybridge. The lower deck offers a four double cabins arrangement in a traditional layout with each room served with its own en-suite shower head. Crew quarters is located aft and offers three berths in two cabins and features direct engine room access. Power options start from twin Cats 1622hp and go up to Man 1800hp units. All engines offer thirty knots plus speeds and also low speed planning for rough seas handling in comfort. 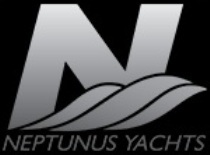 Neptunus presents its new World wide web showroom. Founded in the seventies in Holland, Neptunus has over the years and into the nineteen nineties transferred itself into Canada. To be exact in St.Catherine Ontario, with a less to hour distance from the Buffalo airport. Currently Neptunus has a 6600 square meter facility in the area, where its builds seven models of yachts which start at 55 feet with the 550 Express and go up to the 725 Motoryacht. Neptunus new website takes you around with the following buttons; Home, About, Inventory, Motoryacht, Express, Boatshows, and Contact. Ferertti Custom Line launched its first 37 Navetta on Friday July 29 2016. The new 37 meter long super yacht is the outcome of a complex design process in which the Ferretti Group engineers, architects and designers were engaged for over a year. Built in the La Spezia shipyard, Navetta 37 features strikingly clean lines, well-balanced spaces, and meticulous attention to every detail, a combination that makes for an innovative super yacht yet with a timeless elegance. Born from the collaboration between the Strategic Product Committee, in which Ferretti Group is proud to have Mr. Piero Ferrari, the Engineering Department and Studio Zuccon International Project, the new ship applies the qualities of seaworthiness, comfort, safety, and customization in Custom Line's DNA from birth. A revolutionary product in terms of style, design and spaces, putting it in a place of its own in this class of yacht. As expected, the new Ferretti Custom Line 37 Navetta is already proving a success, with three units sold before its launch: one in Europe and two in the Middle East. Salpa presents the project for a new Laver 52X flagship set to replace the 50.5 launched in 2008. The project of the Laver 52X is very much based on the 50.5 with similar interior layout and exterior lines. The most visible change so far in the project rendering is the addition of new large view windows serving the cabins below deck. Living will be all on the main deck and below deck is reserved for accommodation. The Laver 52X offers a three double cabins two heads layout with a forward owners room to fore, and larger guest VIP cabin to port side. Power for the sixteen tons displacing Salpa Laver 52X come from twin Volvo 435hp with IPS pod propulsion, which if the numbers of the 50.5 model where correct should give max speed in the mid thirty knots. Estensi shipyard an Italian builder of reliable, elegant and appealing traditional lobster and explorer trawler cruiser and yachts, continues along the path of renewal with the new 535 Maine. After the project presentation in Düsseldorf past January, the new model was launched in June 2016, and now will make its public debut at the Cannes show in September. The new 535 Maine follows in the footsteps of the hugely successful previous model, the 530, of which a total of 35 have been sold. A total of 60 Maine series have been sold including the 480 and 640 sister models rewarding the technical solutions and semi customization Estensi introduced in this series of explorer trawler cruiser and yachts. Today the 530 Maine evolves into the 535, which offers some important new features based on experience and the latest technology available. Big side windows illuminate the three cabins below deck, while a new solution has been devised for the door between the cockpit and the saloon enabling a single space for even more direct contact with the sea. From a technical standpoint, Estensi also starts a new partnership with Volvo in this model with twin 435hp units powering the 535 Maine. Other important upgrades for the 535 versus the 530 will be a pivoting hydraulic swim platform and joystick for maneuvering. 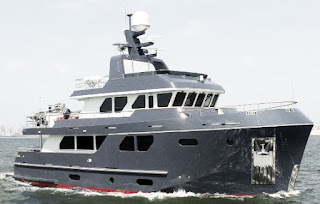 Important note that the 535 Maine keeps the flexibility Estensi is known for with three versions available for the main deck design solutions. A household name in custom sportfish boat building, Spencer is nearing close in delivering its hull number one hundred, which is to be a 74 feet. Building one hundred boats is always a landmark, a lot more so for a custom yacht builder as Spencer, with each build being to order from a client. With the 74 feet Centurion, Spencer went to social media and a sponsored build by its main suppliers. Indeed this build has received sponsorship from Westernbranch MTU dealer, Alexseal, Gplink, Seakeeper, Aqualama, Veem, Wildcat, Onan, and Technicold. Splashing of Centurion should be soon, with the build starting in late 2015 and expected to splash end Summer 2016. Sunseeker are going at it full swing in its smaller sizes and this completely new 52 Manhattan is a complete testament of a fresh breed of life in what is today the Poole boat builder entry level flybridge motor yacht. 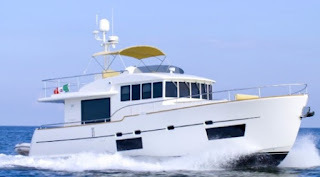 The new 52 Manhattan brings a first feature for the builder from Poole which has a main deck layout with an astern galley, which joins entertainment with the aft cockpit. It was over ten years in 2004 when Ferretti introduced this in the 630 model, and many others have followed since then to what is a practical solution for the galley in this size. The 52 Manhattan impresses in a lot of areas, its flybridge being one of the most spacious in this size and features a double dinette solution to aft and port side of the helm, along a forward sun-pad. Windows everywhere a theme of Sunseeker's latest models is again the chorus of the new 52 Manhattan with the saloon windows impressing for there size. The 52 Manhattan is powered by twin Volvo 725hp units in pod drives or line shaft propulsion with top speed up to 31 knots. Since coming into new ownership Canados has been working fast around the clock to launch new projects aimed to put the brand at the top of the packing order in the semi-custom super yacht spectrum. So after first presenting the 76 Oceanic which is currently being tested, Canados presents the project for a new 90 Gladiator which replaces the 90 Open after a ten years plus production run. The 90 Gladiator is based on the hull of the Open, which apart being fast is also a very seaworthy design aimed at keeping sustained high speeds even in rough seas. Technically speaking the 90 Gladiator is a make up improvement of the model it replaces with a new hard top and window profile, and a fore-deck with the must have dinette and sun-pad. Canados 90 Gladiator will also be available with three engine propulsion choices; twin Man 1900hp with shafts, Mans 2600hp with Arneson surface drives, and triple Man 1900hp with Top System surface drives. Speeds go to the max of 33 knots of the first option to over 55 knots of the last option. In the triple engine option the 90 Gladiator will receive a structural upgrade with hull build in Kevlar Aramat fibers, Carbon reinforcements, and interior furniture in honeycomb. Bering has launched its first 80 model in Zhangjiang in South China. Currently hull one of the 80 series she is undergoing her first sea trials in the region. Bering 80 is currently the largest and fourth build so far from the American-Chinese builder, and part of its Expedition line. Important note is that Bering does have bigger project designs of a 95 and 115 awaiting the signing on the dotted line. Bering 80 is a two deck and a half explorer type super yacht with a full displacement hull and build all of steel. Standard layout offers five double cabins, included a main deck owners stateroom. 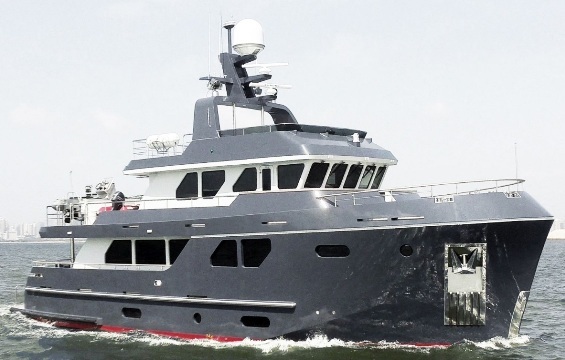 Bering 80 also breaks some records as being the heaviest yacht in its class, Hull one also featured larger fuel tanks by ten thousand liters, and was painted in an aggressive Alexseal dark gray paint. Sasga presents the project for a new 68 Minorchino flagship. Continuing its venture with Barracuda Design, responsible for all the models of Sasga, the Minorchino flagship follows as all the range the traditional Spanish fishing boat lines transformed into a yacht. 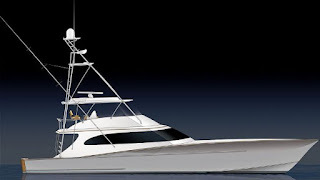 The 68 Minorchino will offer choices for a three or four cabins interior layout. The three cabin layout offers a large full beam midships owners stateroom. Interesting details will also be a saloon fully dedicated to entertainment with a galley located at midships by the crew quarters, and that the four cabin version will still offer a four shower head arrangement. Power options will come from twin engines from 600 to 900hp, with estimated top speeds up to 24 knots with the large option. When the market is giving you a lot of feedback it is normal that you attack more and try to increase your share. This is what Prestige has been doing in recent years and the 630 comes as an expected surprise new model for the 2017 season replacing the 60/620 after six years production. Designed as all the range by Garroni, the Prestige 630 mimics the exterior style of the larger 750 and 680 sisters in a smaller size. Inside the 630 also continues with recent practical elements as a spacious astern galley, large galley wet-bar on the flybridge, and a separate entrance for the owners midships stateroom. Other interesting elements of the Prestige 630 will also be the large well laid out flybridge and a big yacht feel all around especially when compared with the replacing 620. 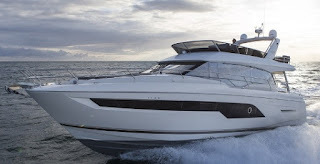 The Prestige 630 will be powered by twin Volvo 725hp with IPS pod drives which give it a 28 knots max speed and 24 cruise, possibly these medium average speeds being its Achilles heel versus it major competition. The Targa 62 GTO is the first of the new generation of models from Fairline featuring the design of Italian Alberto Mancini, with naval architecture by renowned Dutch firm Vripack. The Sport Yacht is currently in the final modelling stages with production set to begin coming autumn 2016 and customer deliveries expected in the summer of 2017. Mancini’s influence is clearly evident in the Targa 62 GTO, resulting in a sleeker look for Fairline and an evolution of the recent British builder styling. The Targa 62 GTO is designed to suit Fairline’s varied global client base, offering complete flexibility of layout with a multitude of options to suit each individual customer. For example, there are three different galley arrangements, allowing clients to choose the best configuration to suit their needs. A choice of long cockpit or saloon variants, the former offering large outdoor space, the latter for those where air conditioned interior space is more important. Maximizing space and comfort are the key features of the Targa 62 GTO with every centimeter optimized. Regardless of specification, owners will find a large saloon and cockpit as well as an impressive full-beam master cabin with adjoining full-beam en-suite. The boat features a large sliding, glazed sunroof and powered patio doors that disappear through the cockpit floor transforming the main deck and adding to the overall sense of space and light. As well as ensuring the sea-keeping and handling qualities that Fairline is known for, Vripack focused heavily on minimizing noise and vibration levels throughout the boat. This, in conjunction with Fairline’s proven monocoque construction, maximizes on board comfort for all. More details for the Fairline 62 Targa GTO, as engine choices, and exact layout details will be given during the fall 2016 boat shows. Rossinavi a super yacht builder from Italy presents its new World wide web showroom. Founded in 1970, Rossinavi started first as a company dedicated to metal carpentry. Into the years and with passion Rossinavi evolved into a super yacht builder launching its first model in 2004, a 28 meter semi displacement two deck and half build with a steel hull and alloy super structure, designed by the builder in collaboration with Quartostile. Since then the builder has launched nine other super yachts with various other designers and all larger to the first build, with the largest being the 2011 launched Spadolini, Axis, and Salvagni designed 70 meter. Currently Rossinavi has five other builds in progress that start from a size of 46 meter and go up to 63. Rossinavi has over the years aquired three facilities, two in Viareggio; Polo nautico in 2006 and DR12 in 2010 used for the fitting out of the yachts, and one in Pisa Navicelli which is dedicated for the construction and was purchased in 1996. Rossinavi new website is available in Italian, English, Russian, and Chinese language and takes you around with the following buttons; About Us, Fleet, Production Sites, Center of Excellence, Media, Location, and Careers. Rossinavi is also available on Facebook with a link at the bottom right of the page. Cruisers present the project for a new 60 Fly, a model based on the 60 Cantius platform with the added flybridge deck. Beglian designer Facheris did an incredible job in creating an additional entertainment area up top. Access to the flybridge will be from a staircase to starboard. The flybridge will feature a layout of U-shaped settee aft, central wet-bar and helm station, and three forward chaise lounges. Interior options and engines in the 60 Fly should mirror those of the 60 Cantius, with two or three cabins choices below deck, and Volvo 725hp engines with IPS pod propulsion giving speeds up to 35 knots. Storm yachts from Holland continue to turn its projects into reality and after building its first X-53 model, launches it's second the X-65. Again a project of Frank Laupman for exterior and interior with Van Oossanen responsible for naval architecture and the patented Fast Displacement Hull Form, Storm X-65 offers a three cabins, three heads layout with an owners stateroom located at midships. Living is all concentrated on the main deck with a living saloon on entrance, galley to starboard, and dinette to port side. Helm station is located in a central position. X-65 also features a fly bridge, although hull one of the series has used this purely for sunbathing purposes. Standard power is twin Volvo 800hp with IPS pod propulsion, or optional line shaft and slower Cats 375hp units. Cantiere delle Marche has had a very busy Summer season, with new orders continuing to fill the books of the successful Italian builder who is currently dominating the explorer super yacht market in between 24 to 35 meters sizes. In July alone Cantiere delle Marche received two new orders and following another 102 Darwin, the Italian builder got commisioned for a fully custom 32 meter full displacement order which is to be called 105 Accaio. Little details have been given so far to the full custom 105 Accaio. We know due to the design above that it will be a three deck super yacht, and that it is a design of Hydro Tec, the same studio responsible for all the Darwin class line. In the 105 Accaio the owner wanted a more modern exterior look then the Darwin range, along with a large tender garage aft, which will be an interesting challenge for Cantiere delle Marche due to the seamanship first nature of its builds. Riva continues to be very active and at the start of Summer 2016 season launched an event which presented two new models, the anticipated Rivamare, and the surprise 76 Bahamas. A lot of history again going on with the name used for the new Bahamas which was the open sport yacht flagship of Riva in the early nineties, launched as 58 in 1991 and modified to a 60 from 1996 onward and delivered in 21 units in its life span. The 58 Bahamas was also the start of a legacy, that of designer Mauro Micheli of Officina Italiana who designed all new Riva models since then. 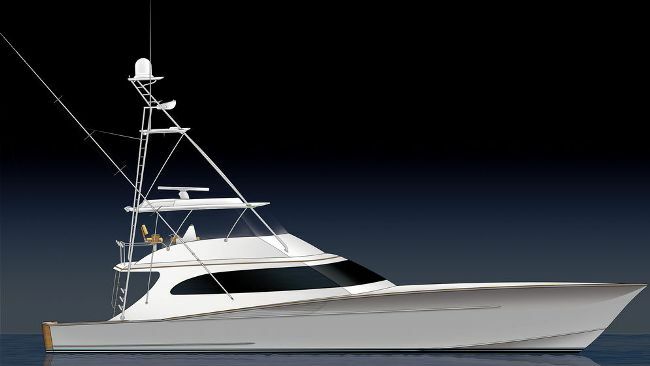 The new 76 Bahamas is build on the very well received Perseo platform launched in the fall of 2015, and also uses the open invisible hard-top solution as used on the 88 Florida. It is primary an open model which in need can fast become a hard-top coupe. Austin Parker presents the new project for a 74 Fly S, a model which is also launching the motor yacht line from the Italian builder start at 23 and going up to 31 meters. The new Austin Parker 74 Fly S is elegant and large, with innovative and superb fore deck spaces, and wide walk-around side decks. The flybridge of the 74 Fly S also follows tradition and will have a double access: from the aft deck or from the main saloon. A jacuzzi pool on the flybridge testifies the elegant design and spaciousness of the new Austin Parker flagship. 74 Fly S also features a hydraulic bathing platform and large hangar for tender, jet-ski and other toys. Great brightness for the custom made interiors made to owners request and all having superb attention to detail. Layout will be for an owners stateroom located at midships for max space and comfort, with three other guest cabin, and a crew cabin berth for two. Power is twin Man 1400hp engines with max speed of 33 knots, and a cruise of 28. An alternative slower longer range version with twin 800hp engines will also be available. The standard web media news feeds have been pretty busy with yachts in Summer 2016 with two accidents making quite a few headlines around the web and both of which happening in Ibiza. While no causalities where reported in both of these accidents, in my opinion they should raise a few industry question marks regarding safety at sea. The first accident happened to a Ferretti Custom Line 124 with a 30 feet rib tender crashing into its starboard and onto the large hull windows serving the VIP suite at a 30 knots plus speed. Apart destroying the window the interior damage as shown in one of the photos was huge. To make it short all the cabin will need to be redone. Second accident was the Peri 37 m who anchored off the coast in Ibiza starting to embark water into the opened stern beach bathing platform. Fortunately and thanks to the work of the crew M/Y Fusion was just saved from sinking. In my opinion both accidents should see classification societies and safety organizations go more into detail what is happening here. The accident of the tender is an interesting one, with side hull windows becoming much larger each other year, it is interesting to see the level of tolerance and flexing properties this has versus fiberglass and or other construction materials. The second accident is a repeat with a similar happening in September 2012 to a Baglietto 43m off the coast of St.Tropez. While sensationalism and innovative gadgets in yachts are cool at the boat show, safety behind it should not be an option and has to be of paramount importance. If it is not safe then you cannot do it, simple as that. Are designers and boat yards missing safety in order to impress and generate more interest to there yachts. Side hull windows are become larger by the year, and the same is happening to the bathing platforms who in recent years have doubled in size and are being called stern beaches. The pleasure boat building industry should be careful to not become victim of its own innovative success, and not forget that the first reason to build a boat is for it to be safe at sea.